The Acadie-Bathurst Titan got goals from Jeffrey Truchon-Viel and Samuel L’Italien to win Game 6 of its series against the Blainville-Boisbriand Armada by a 2-1 score and lift the 2018 Rogers President Cup on Sunday afternoon. 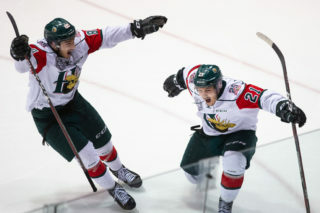 With the victory, the Titan won its second QMJHL Championship since relocating to New-Brunswick, with the last one coming back in 1999. 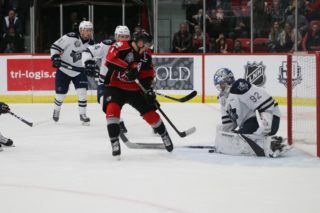 For the Armada, the loss marks the second consecutive season that the Blainville-Boisbriand team has fallen short of winning the franchise’s first title in the final series. Despite surrendering a goal to Drake Batherson with 2:45 left on the game’s clock, Titan goaltender Evan Fitzpatrick was sensational in net by turning aside 29 of the 30 shots he faced in the win. Down the other end, Émile Samson ended the game with 24 saves for the Armada. 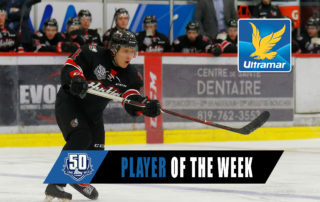 Truchon-Viel, the recipient of the Guy Lafleur Trophy as playoff M.V.P., opened the scoring with an unassisted goal that came following a wrist shot through Samson’s five-hole at 6:37 of the first period. Acadie-Bathurst ended the first frame with a 12-3 advantage in shots on goal, but the Armada flipped the script in the second period, in turn outshooting the Titan by a 12-5 total. Despite the constant attacks from the Armada, the Titan were the only ones to get on the board in the middle frame. With 2:59 to go in the period, L’Italien rushed through the neutral zone before skating in and beating Samson with a perfectly placed wrist shot beneath the blocker to give the Titan a 2-0 lead heading into the second intermission. It was, at that time, only the second shot on goal for Acadie-Bathurst in the period. The game’s next goal was Batherson’s, who ended Fitzpatrick’s shutout hopes with his 13th goal and league-leading 33rd playoff point, while the Armada was playing with an extra skater due to a pulled goalie. Statistically-speaking, Fitzpatrick set a new franchise record and finished with a league-leading 2.10 goals against average in the playoffs. He also topped all post-season netminders with 16 wins and two shutouts, as well as finishing third with a .925% save percentage. 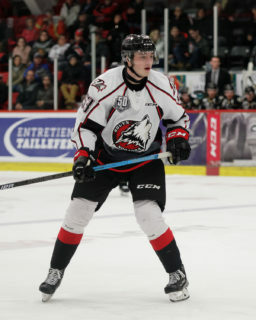 Offensively, Batherson (33), Alexandre Alain (30), Alex Barré-Boulet (27), Truchon-Viel (23) and Joël Teasdale (21) made up the top-5 in the playoffs scoring race. The Armada’s Alain (16 goals) and Batherson (20 assists) each topped their respective stats categories, while Titan skaters trailed them in both; Truchon-Viel with 14 goals, and Olivier Galipeau with 15 assists. Acadie-Bathurst will now move on to represent the QMJHL at the 100th Mastercard Memorial Cup Tournament held in Regina, Saskatchewan. 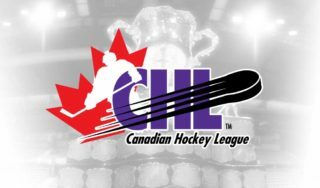 The Titan will open the competition with a game against the Western Hockey League’s champions (to be determined) at 4 p.m. ET / 5 p.m. AT on Saturday, May 19.